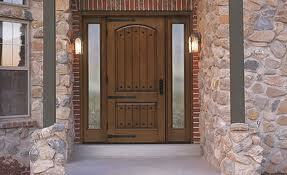 General contractors San Diego often will replace worn or damaged doors. Many older homes have doors with cracks, deep scratches and holes that need replacement. The entryways from outside to inside the house as well as entrances to rooms and closets are covered by a wide range of doors that open and close using hinges and sliding methods. Entry doors for San Diego home additions include front, back and side doors into the house from outdoors. The most common of these is the slab door. The slab door is one piece made of materials like wood, composite wood and metal. The surface may be flat or textured. Often, recessed or raised panels in the slab doors are decor details. Sometimes, a slab door has a window set in the top half. Additionally, a screen door is often attached in the same door on the outside of the slab door. A screen door has the measurements of the door to fit closely and not let in any bugs. A solid frame normally made of metal surrounds a screen through which air passes. The screen is a stiff and fine mesh net that keeps bugs and mosquitoes out of the home. One popular San Diego home remodeling job involves adding a patio or porch in the back of the home. A deck, patio or porch is attached to the house and brings living space outdoors. Normally, a double door size opening is created in the wall to which the patio is connected. The double door lets in more light with sliding glass or French doors. The sliding glass doors are heavy with a metal or wood frame around a double paned glass window. These doors slide on a greased track built into the door frame. Some of these paned glass panels are insulated for energy efficiency. Meanwhile, French doors use multiple panes in a grid pattern to let in the light. The thick glass and frames are snug against each other for energy efficiency. In San Diego family room additions closets have either slab doors, sliding doors or double-folding doors. When it comes to double-folding doors, the wood or metal panels of the door have 2 narrow slabs and as tall as the door opening. In an accordion effect, the door slabs fold together to open and fold out flat to close. Usually, the double folding doors are anchored in a running track. For the best San Diego home additions and remodeling jobs, fabulous doors for all entryways and closets are available. Adding a new door helps to upgrade the room and home. On the market are attractive and quality that are energy efficient.